Are Dress Shoes Supposed to be Long? Whether dress shoes need to be long or short is something that depends upon a range of factors; however, no matter which dress shoes you choose, your toes must never touch the tips of your shoes. The choice of which length of shoe is best for you is something that can be simplified if you keep a couple of essential considerations in mind. It’s not the length of the shoe that is the most important consideration. Rather, it’s about the overall size and fit. One of the many reasons why dress shoes have a bad reputation for being uncomfortable, pinching toes and creating sore heels, isn’t because they are either too long or too short, but because overall, they are ill-fitting. 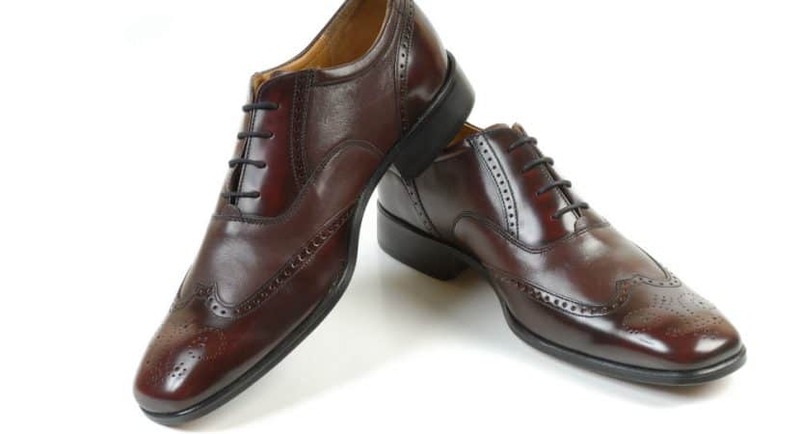 While it’s a well-known fact that a good leather dress shoe does indeed need to be broken in to a certain extent, in the end they should fit so well that you barely notice you are wearing them. It will come as little surprise then that one of the very reasons why gents suffer so much with their show size length is because 80% of them are wearing the wrong size. Here we’ll be taking you through the importance of correct shoe sizing, how the shape of your foot affects shoe choice, factors influencing and influenced by the choice of your heel, and how to ensure that you get the best length of dress shoes for both style and comfort. Again, under no circumstances should your toes press or bunch-up against the tip of your dress shoes. This shows that the size is clearly wrong and the shoes are too short for your feet. Dress shoes need to fit comfortably the first time that you try them on. As with all shoes, there is a small amount of break-in time; however, the difference in size will be negligible from your starting fitment due to the design of dress shoes themselves. This is even more pertinent when opting for an all-leather shoe, or a pair of dress shoes using a leather heel inlay. Length might well be a very important consideration when it comes to a softer and more flexible, active style shoe like a sneaker or a training shoe that are meant to have more give and movement inside them. However, for a dress shoe, which some go as far as to call the king of shoes, you want them to fit exceptionally well. Not snug as such, but definitely a close and comfortable fit. One of the reasons for this is because a dress shoe will eventually mold itself to its owner, complying with your foot size. If you get anything too long, then that process won’t be able to handle as organically. Worse still, if you shoe is too long, over time you will be able to see that as the leather cracks and creases it highlights the fact that you are wearing ill-fitting shoes. You will notice a distinct trend between most major shoes. Some are designed specifically for elongated, narrow feet, while others grant greater width allowing comfort for those of us with shorter feet. If your toes touch anywhere, walking will be very uncomfortable. If this is the case, go half a size up or opt for a different brand or product range entirely. Finding your correct dress shoe size is a far more important consideration than its length. By that we don’t mean just the width either. A true shoe size is really established by looking at three separate measurements: overall length from heel to toe, the width of your foot, and additionally your arch length. That’s the measurement from your heel to your ball. In a dress shoe that is an important consideration because a dress shoe by nature is designed to flex at the ball. If you omit this measurement and only focus on length, you will be left with a very uncomfortable experience and perhaps even some damage both to your foot and to your shoes. If you are at all concerned about getting any of these measurements correct, then you could use something called a Brannock device. This is by far the most accurate way of taking all three of these essential measurements. It looks like some form of caliper like contraption but it very accurately gives you a great read and indication of the shoe size that is going to really suit you best. So remember, dress shoes, first and foremost, are meant to fit you like a second skin, mold to your shape over time, and be both comfortable and elegant. The higher the heel and the more tapered the shape, the more important it is to choose a pair of shoes which leaves you enough movement for your heels and toes. It is only in the case of flat shoes, where no amount of play should be possible. The more tapered the heel, the wider the gap between your foot and the heel seat, therefore a higher heal cut will also be needed. The instep has a great effect on shoe fitment, with the instep being determined by the shape of your foot. You will find that the length of your shoe, its waist area, and its arch are all relative to the dimensions set out by the length and breadth of your instep. Stay aware of the shape of the form of your instep to have a good idea of what size and shape you need when shopping for new dress shoes. The width of your heel seat and shape of the instep determine the waist of your shoe. This is the area directly behind the ball flex point of your foot and is supported by your insole. The waist area needs to carry the weight of the lateral sides of your foot comfortably. Pick a shoe that is too narrow, and your weight is distributed wrong, too wide and chafing can occur. The arch fit refers to the support for your heel arch and the support provided by the insole of the heel seat. As before-mentioned, this gap is determined by the height of your heel. Too much room and your shoe will be prone to slipping off. Any dress shoe which has specifically provided additional support for the heel arch will suit those with flat feet better. You will typically find that these shoes are shorter than other varieties. The shorter length and wider base allow for better pressure distribution. The need for an elongated width becomes even more important when you are a heavy set person. Wide shoes, which are typically shorter shoes with a broader toe, are the best for both flat-footed individuals and those of heftier weights. Be sure to check the shank, or waist, of your shoe to check for heel arch support. In most cases, these shoes will be in a style best suited for you. Just as is the case with the shape and form of your foot determining whether you need a longer or shorter shoe, you will also find that certain shapes of shoes are better suited to different types of feet. Those with wider feed will prefer the open lacing, short structure of the Derby style, whereas those with long, large feet will have better wear from a double-buckled monk shoe as this gives more even pressure distribution. For anyone struggling to find a snug heel fit, give any formal shoe sporting a strap a try, while functional straps are preferred due to allowing complete control over the tension. Those with narrow feet, as well as those with a low instep, will find the best fit from a closed lace shoe, such as an Oxford, or slip on dress shoes such as loafers. Your dress shoes need to fit comfortably while fitting the form of your feet snuggly. This is the most important prerequisite to shoe length, with the length varying according to the before-mentioned fitment factors. A general rule of thumb to follow is to make sure that there is a maximum gap of ½-inch between your toes and the tips of your shoes, while the gap between your heel and heel seat should be half of a finger-width. There is no harm in going half-a-size up. Remember that by midway through the day your feet begin to swell at a rate which increases towards the late afternoon. This makes it extremely important to choose a shoe which does not fit too tightly. Don’t choose a shoe based on aesthetics alone. Picking one whether you like the look of a longer dress shoe or a shorter one, will leave you open to a great amount of discomfort. The length of your shoe will be set out by the style that you choose and the exact design of your choice. However, keep our tips in mind and you will prevent yourself a great deal of pain while being able to filter the best individual dress shoe styles for your unique needs with ease.